Known as the “Freedom Frigate”, in 1781, the Hermione carried the Marquis de Lafayette to deliver news of France’s participation in the American Revolution. The Marquis arrived in Yorktown aboard the vessel Hermione on March 14, 1781, where he played a key role in the naval blockade that led to the surrender of Cornwallis and the end of the American war later that year. Fast forward to 1995, when a small group of French enthusiasts dreamed of reconstructing an exact replica of General Lafayette’s 18th-century Hermione. The plan envisioned the Hermione sailing to the US – bringing to life a recreation of the voyage made by Lafayette and re-affirming the historic relationship between the US and France. The vision now reality, the majestic Hermione was reconstructed in France using 18th Century shipbuilding techniques. The vessel is the largest and most authentic Tall Ship to be built in the last 150 years. In the spirit of friendship and to celebrate France’s important role in helping our nation’s founding, the Hermione US journey begins in France on April 18, 2015 and will call on American ports during the summer. The crossing is expected to take 27 days, before making landfall at Yorktown, VA. Crossing the Atlantic, Hermione’s first voyage will begin in France from the mouth of the River Charente, in Port des Barques (where Lafayette first boarded on March 10th, 1780). The 72-member French volunteer-crew makes its first stop in Virginia. 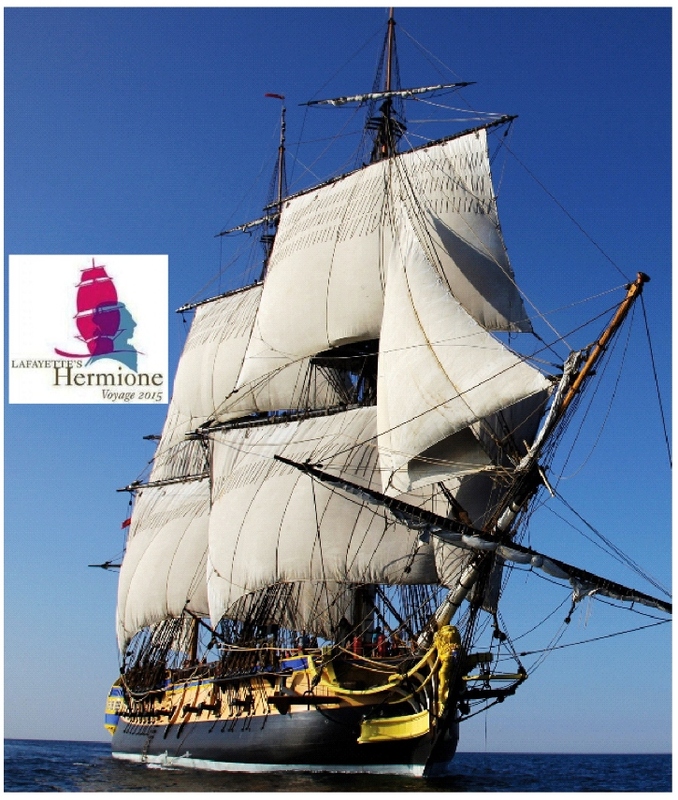 The Hermione will then sail up the east coast – near Washington DC at Mt. Vernon and Alexandria, then on the Annapolis, Baltimore, Philadelphia, NY, Greenport, Newport, Boston – then leaving America, on to Castine, and Lunenberg/Halifax, Nova Scotia before heading back to France. Christened “America’s Adopted Son” Marquis de Lafayette became a true hero of America and was officially. The eager 19-year-old Lafayette sailed the original Hermione to America In the late 1700s. He immediately became a volunteer in the fight against the British, was commissioned Major General, and became a pivotal player in helping secure American Independence. Later wounded Lafayette returned to France, but remained a steadfast supporter of America. Returning to Boston on March 19, 1780, aboard the Hermione, Lafayette was greeted with a heroes’ welcome with a 13-gun-salute. In 1781 Lafayette was dispatched to the Virginia frontline; the Hermione was sent to Philadelphia, where using stealth tactics, she assisted in fighting the British as part of the blockade that sealed the defeat of the British. In 1782 Lafayette left Washington to return to France. Mike Dwight April 22, 2015 Category: Uncategorized.